Come and enjoy our comfortable 2 & 3-bedroom housekeeping cottages; situated on beautiful Restoule Lake just southwest of North Bay, Ontario. Our peak summer season offers both fishing and family vacations with a natural sand beach for all to enjoy. In the Fall we offer the challenge of fishing for muskie, walleye, bass, lake trout, whitefish and pike and have a variety of back lakes to choose from. Also in the Fall season, Martin’s Camp specializes in a Black Bear Hunt. Services offered are boat & motor rentals, live bait, camping, gas & oil, laundry facilities. Call for a reservation and enjoy your next holiday in Ontario’s beautiful Near North. Four Season vacation resort on the Pickerel River in Port Loring. Fully equipped housekeeping cottages, 2, 3 & 5 bedroom, motel units, American Plan packages available. Fine dining, Swiss chef, restaurant open daily, specials, catering available. Licensed lounge with pool table and satellite TV. Conference room, corporate events. Gift shop, souvenirs, tackle. Fishing licences. Live bait. 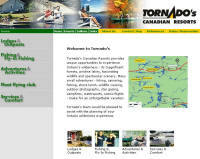 Boat, canoe, kayak, catamaran rentals. Parking, dockage, launching ramp. Fuel & oil. Fly-in fishing outposts, walleye, northern pike, small & large mouth bass, all-inclusive packages at Smoky Lake Lodge & Portage Lake Lodge. Fishing guides available. Wilderness retreats at Straight Lake Outpost & Blue Pine Outpost. Air charter service, sightseeing flights, aviation fuel, flight training, float plane endorsements. Snowmobiling packages in winter, American Plan or housekeeping, cozy lodges with fireplace, hot tub, sauna, just off the Cloverleaf Trail system, trail AR501. Dogsledding packages. Visa, Mastercard, Interac.